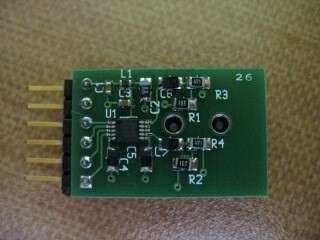 This is an I2S-based Audio DAC that can be connected to 6-pin Digilent peripheral module sockets. 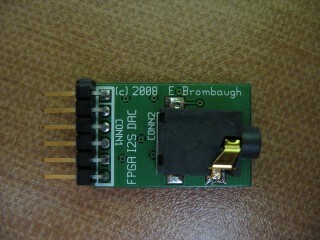 It provides a 24-bit, 192kHz stereo audio DAC with line-level outputs. Test Code: (UPDATED) This is a complete ISE 10.3 SP3 project targeting the Avnet Spartan 3A EVK which drives the DAC at a rate of 41.7kHz for evaluation purposes. It provides a sawtooth on the left channel and a sine on the right channel. The A and B capsense pads raise and lower the pitch and the C pad serves as a gate. I've built up a small stock of these (less than 30) and they are available for purchase while the supply lasts. As of 12-18-2008 I have 11 built and parts on hand for an additional 18. If you're interested in buying one or more, please contact me Eric Brombaugh to check for availability. Price is $25 (US) each and $5 shipping for any quantity up to 5. Payment via Paypal is preferred. Please contact me prior to paying to ensure that I've got sufficient stock to cover your order. Which is identical to my original.